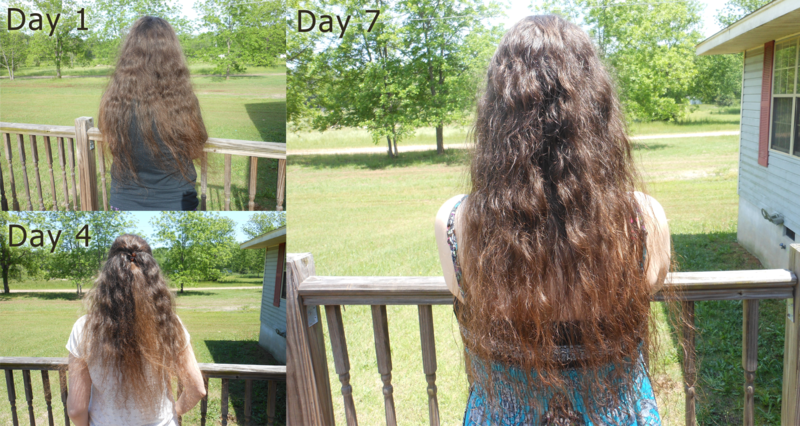 Well, today was another wash day, and there you can see the progress of how my hair looks. Day 1 it was drab and lifeless and pretty crappy looking. On day 4 there was more color, more shine and it felt better. Today is day 7 and it’s shinier and has started getting more wave. I couldn’t get a front shot because of the sun, but even my bangs have wave. It’s not a day-and-night transition, but there is certainly steady improvement. The only thing that still bugs me about my hair is that it’s pretty dry. It feels fluffy, but it remains a bit crispy. I’m hoping that in time it will soften up. Maybe I need more vinegar in my mix, or to do a nourishing treatment on the lower part. One thing I’m really glad for is that it’s not making my hair oily. I read so many pages that said your hair would be an oil slick for the first few weeks that I was totally expecting it, but it hasn’t happened. As a matter of fact, it seems less oily on top than before, which is good for me, since it was pretty gross on top after about three days. Speaking of oily, Eric has really oily hair, and he decided to go along on this adventure with me. He hasn’t washed his hair yet today, but he did on the 4th just like I did. His hair was soft, clean and he saw some highlights that he’d never seen before. Like mine, his hair was drab, but he has much oilier hair than mine. He’s been stunned and pleased at how clean and nice his hair felt. Normally by now he’d have really oily, nasty hair, but it’s barely looking dirty. I guess this means that even though we’re different genders and different hair and scalp types, we can both enjoy the benefits of the treatment. Another thing of note, we’re both using the same mix and we still haven’t emptied the first bottles. I made up 1.5 cups of each and there’s still enough for him to wash today and then my Sunday wash. I don’t know if you’re “supposed” to use more than 1/4 cup each time, but that’s what we’ve been doing. It might be a little more, but not much. At any rate, we’re both happy with the results so far. Awesome that you’re already seeing results! Very 🙂 I’m glad that all these switches away from commercial products are going so well. I really hope that my posts about it all will get more people to give up the chemicals and go more natural. I really won’t feel bad if a lot of these companies lose business. I’m sure they can all find something else to sell. Most of them own so many different commodities businesses that they probably won’t notice much of a dip. Speaking on natural, I saw you signed up for Graze 🙂 It’s a great little service for healthy snacks. I’ve only had a couple I didn’t like so far. Most were tasty and healthy. Yeah, I’m going to try a box and see what I think. I don’t know if I’ll keep the automatic deliveries, but I may get a box from time to time. My first one should be here this week.